A giant panda at the Bifengxia Giant Panda Breeding and Conservation Center in Sichuan Province. Thanks, pandas! Conservation areas set aside to protect China's national treasure also help to save many of China's other one-of-a-kind species, new research reveals. Pandas get disproportionate attention and conservation funding, but the new study, published online today (Sept. 16) in the journal Conservation Biology, offers some good news: The fuzzy-faced black-and-white bear is not surviving at the expense of other, less-cute species; instead, panda preservation creates a sort of conservation umbrella that benefits lots of species. But the laserlike focus on pandas has left some gaps in protections for other animals, according to the new study. Amphibians, in particular, get less protection, the research found. 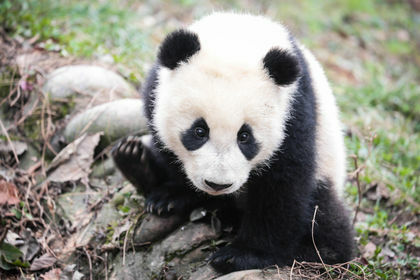 "We should love beyond pandas," Li told Live Science. The panda-loan program provides about $1 million per pair each year for the conservation of pandas inside China. (There are currently about 45 pandas on loan.) The country has also listed the panda as the top species in need of protection in China, and has established a National Panda Program with more than $12 million in funding from 2001 to 2030 for research, breeding, reserves and monitoring. No other species has such singular protections, though China is also home to endangered species like the crested ibis (Nipponia nippon), the Chinese alligator (Alligator sinensis) and the Yangtze river dolphin (Lipotes vexillifer), the later two of which are listed as critically endangered. China has also set aside almost 13,000 square miles (33,600 square kilometers) of nature preserves dedicated to saving panda habitat, Li and her academic adviser, Duke University's Stuart Pimm, reported in their new paper. Li and Pimm wanted to know whether these nature preserves were effective at protecting other species, particularly animals found only in China, such as the fuzzy gansu hamster (Cansumys canus) or golden snub-nosed monkey (Rhinopithecus roxellana), the later of which is endangered. The researchers built a map of species' habitats across China, paying attention to elevation ranges and vegetation types that can determine whether species will survive in each region. The researchers found that panda range overlaps with the habitat for 70 percent of China's forest bird species, 70 percent of its forest mammals and 31 percent of forest amphibians, and 96 percent of panda habitat falls within areas dubbed "endemic centers." These are regions in the top 5 percent for the number of different species living in an area. But there are gaps. Ninety-nine percent of amphibians with small habitat ranges in China are inadequately protected, the researchers found, as are 85 percent of amphibians with more extensive ranges. Particularly concerning were the species listed as threatened by the International Union for Conservation of Nature: 14 mammal species, 20 birds and 82 amphibians. The golden snub-nosed monkey, listed as endangered by the IUCN, is one example, Li said. Also in more danger than previously believed are the Lifan sucker frog (Amolops lifanensis) and the Schmidt's lazy toad (Oreolalax schmidti), she said. Most of the country's threatened mammals live in China's central Sichuan province and northern Yunnan province, while the threatened birds and amphibians were mostly found around the edge of the Sichuan basin, in Hainan and Yunnan provinces, and elsewhere in southeastern China. Few of these species are protected by national reserves, the researchers found, and the protections provided by a few local reserves are spotty. The Daxiang and Xiaoxiang mountain ranges of Sichuan are particularly rich targets for protection, Li said. The areas are rich in species and unprotected by national reserves. Other hotspots lie in the Nan mountains of southeastern China, in Yunnan province (which borders Myanmar, Laos and Vietnam) and in Hainan, an island province east of Vietnam, the researchers wrote. There are 132 mammal species, 117 birds and 250 amphibians that have more than 80 percent of their range within China's borders, Pimm and Li found. Of those species, 65 mammals, 78 birds and 96 amphibians are threatened. Expanding panda protections - while also looking beyond panda habitat - could turn the tide for these species, they said. "China's biodiversity is exceptional; it's extraordinary," Pimm told Live Science. And China has only begun to explore the potential for nature-based tourism to its protected areas, he said. "If we can engage the Chinese authorities," he said, "we can protect an awful lot of species at the same time as protecting the panda."